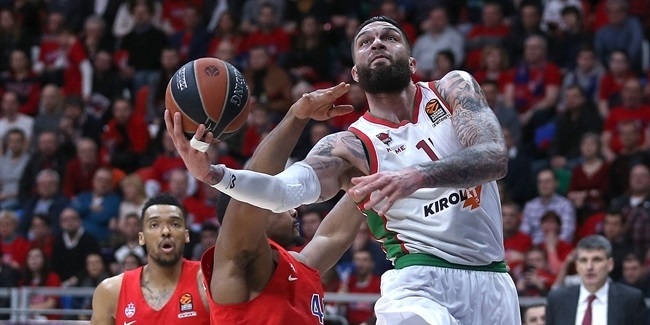 Wednesday was a night to remember for Darussafaka Tekfen Istanbul center Michael Eric, who had the best game of his Turkish Airlines EuroLeague career in leading his team to victory and capturing MVP honors for Round 27. Eric came on late to spark Darussafaka past Khimki Moscow Region 91-85. He posted personal bests of 22 points, 15 rebounds and a performance index rating of 33, which was the best among winning teams in the round. Eric made 10 of 12 shots and also delivered 2 assists as Darussafaka snapped a six-game losing streak. He became the second Darussafaka player to be named MVP of the round after Brad Wanamaker, who achieved the feat in Round 29 of the 2016-17 campaign. The top performance index rating of the round came from Mike James, however, his AX Armani Exchange Olimpia Milan fell 92-89 at Real Madrid. James racked up a career-high PIR of 37 with 35 points and 8 rebounds. Eric's teammate Jeremy Evans had the third-best PIR of the round with 29. Evans went for 20 points, 8 rebounds and 2 assists. Rounding out the list of Round 27's best performers are the Khimki duo of Alexey Shved and Jordan Mickey with PIRs of 28 and 27, respectively. 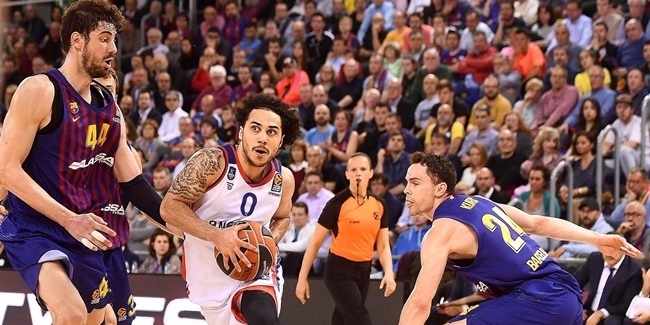 Shved went for 31 points and Mickey posted 22 points on near-perfect shooting in their defeat. Mike James was the top scorer in Round 27 with a career-high 35 points, which took his league-best scoring average to 20.5 points per game. It was the second-most points scored in a game all season. Round 27 MVP Michael Eric's 15 rebounds led all players in the round. Olympiacos Piraeus center Nikola Milutinov remains atop the season-long rebounding charts with 7.9 boards per game. Panathinaikos OPAP Athens playmaker Nick Calathes topped the Round 27 charts in both assists and steals with 12 and 4, respectively. He also leads the league in both categories; Calathes has been worth 8.6 assists and 1.74 steals per game this season. CSKA Moscow big man Kyle Hines rejected 3 shots on Tuesday, which would be the most of any player in the round. Walter Tavares of Real Madrid tops the 2018-19 charts with 1.7 blocks per game. 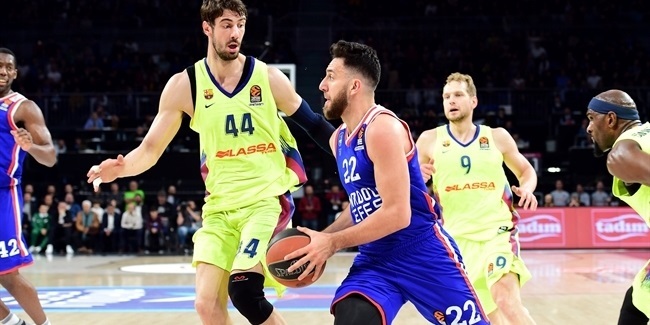 Three players posted double-doubles in Round 27: Eric, Calathes (11 points, 12 assists) and Real Madrid center Gustavo Ayon (11 points, 10 rebounds).